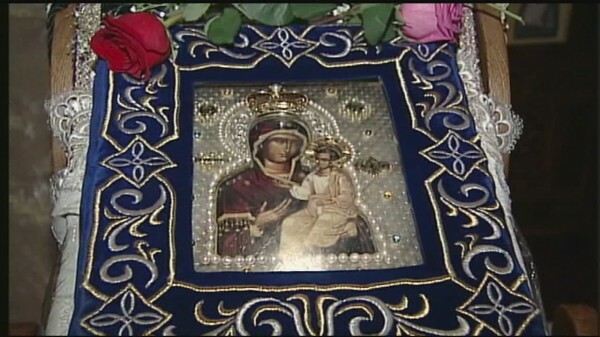 The Orthodox Church in America Diocese of Alaska will have the honor of hosting the miraculous Hawaiian Myrrh Streaming Iveron Icon of the Most Holy Theotokos. The Holy Icon will make a historic and culturally significant journey to Alaska under the omophor of His Grace David, Bishop of Sitka and Alaska, with the Blessings of His Eminence Kyrill, Archbishop of San Francisco and Western America (ROCOR) to the land where the historic Orthodox Church first began in North America. The Icon is scheduled to be in Alaska from July 18th through July 30th, starting in Anchorage, then visiting the Kenai Peninsula and Kodiak Island areas. This holy image, known as a Miracle Working Icon to the Orthodox faithful, is a traditional depiction of the Virgin Mary holding the Christ Child. The Icon originally belonged to an Orthodox family from Hawaii who noticed that the icon began to miraculously stream myrrh in 2007. The Myrrh that the icon streams is a sweet smelling liquid that is collected, and distributed to the faithful all over the US. The icon was officially recognized by the Russian Orthodox Church Outside of Russia (ROCOR) as miraculous and worthy of veneration in 2008. At that time the Holy Icon was given back to the Church and began to travel all of the United States. Since then the icon has been to over 1000 churches and venerated by an estimated quarter of a million people across the US. Besides streaming or weeping myrrh, numerous other miracles have been attributed to the Icon of both physical and spiritual nature.